Spring is around the corner and the countdown to the start of the Holy month of Ramadan has already begun. 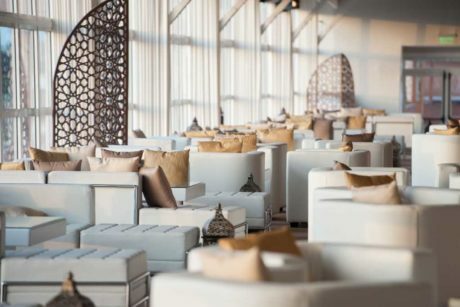 In the UAE, especially in Dubai, the holy month of Ramadan is a study in contrasts with a special convivial ambience. During the daylight hours, the city adjusts to a quieter, slower pace. Some businesses alter their operating hours, creating a shorter working day. But after sunset, with the call to the Maghreb prayer, initiating the breaking of the fast, the rhythm changes. The city comes alive with a different energy. People gather to visit numerous Ramadan Iftar and Sohour tents, participate in special seasonal celebrations, sports competitions, and cultural happenings. The malls and promenades are filled with families shopping, walking and enjoying different activities. We’re only 8 weeks away so whether you are planning an annual corporate gathering, or a special Ramadan event, now is the right time to start thinking about preparing the best kind of venue; and this is where Ramadan tents come to play. 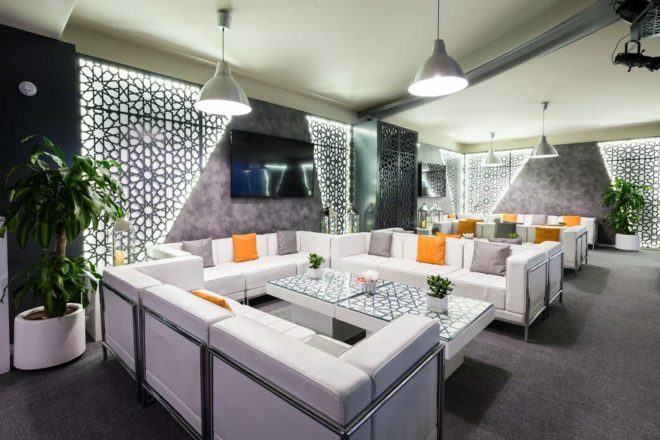 Tents are often used in creating Ramadan settings because they provide so many customisable options including the external structure and floor to ceiling decorative choices. 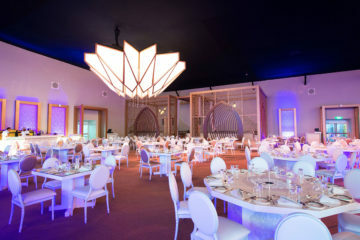 They provide a comprehensive Ramadan venue solution fulfilling space and creative requirements. Tents and their accompanying furnishing and décor can deliver a unique ambience that transports guests to another space and time. 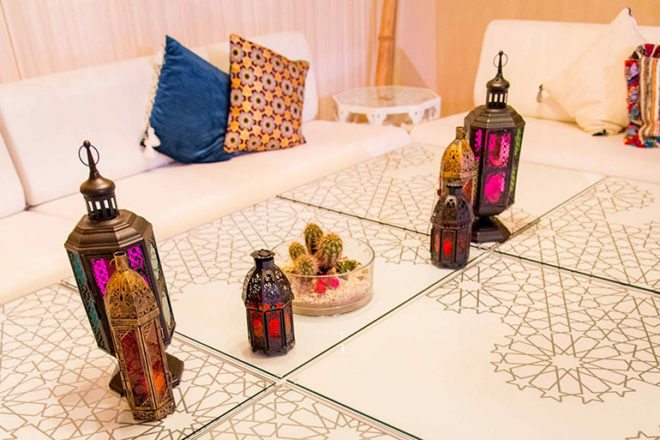 They can be stylish and comfortable with a blend of traditional and contemporary, evoking the Bedouin shelters of the past with an updated Arabian flair. For Ramadan, temporary structures are a great go-to solution for hosting large events or flexibly expanding an existing space to accommodate more guests. Stand-alone structures can be installed almost anywhere in any exterior space – venue grounds, beaches, deserts, parks or promenades, providing a comfortable, cost-effective and secure area for hospitality. We’ve spoken before about how temporary structures increase your venue choices and creative options. Moreover, we have several flexible solutions for exterior structures that can scale up or down in size according to your needs and that give the appearance of more permanent structures, safely and flexibly. The classic two-sloped tent, for example, is spacious and is designed for multifunctional use. It can even be positioned as a double deck structure. 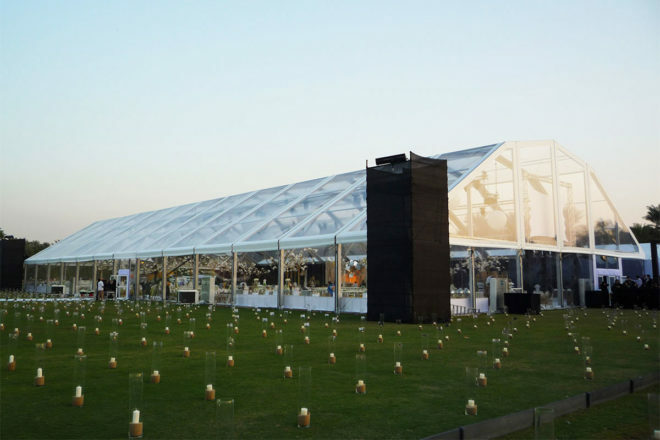 For Dubai Creek 2016, we set up a two-slope transparent tent where guests enjoyed the beautiful night views while being indoors in a perfectly cool environment. The Polygonal, on the other hand, has an innovative shape, available in a variety of widths, with a full grey or clear roof. Both structures can be extended in 5-meter increments. The Cube has an original clean façade, invisible roof and a fully customisable second skin. 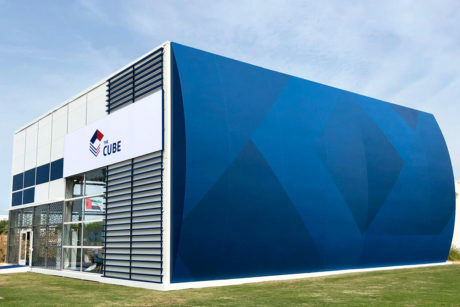 One advantage of The Cube is that its design provides for the concealment of all the unsightly elements that accompany temporary structures like ducting, and A/C units. Additionally, it has horizontal panels allowing for different options such as mashrabiya, clear glass, or black out. For an ultra-quick solution, the dome can be installed anywhere in as little as 6-48 hours depending on the size. It also has multiple customisation and interior connection options, making it a good choice not only for outdoor exhibits but also for indoor activities and events. Tents are not just for creating free-standing structures. Indoor tent solutions can be used to cover terraces or balconies to expand the available area and seating capacity, for example, by covering a terrace or pool area. In addition, smaller indoor tents can be set up inside the venue to create a special VIP seating area, a Majilis, or to construct a showstopping walkway or entry way. 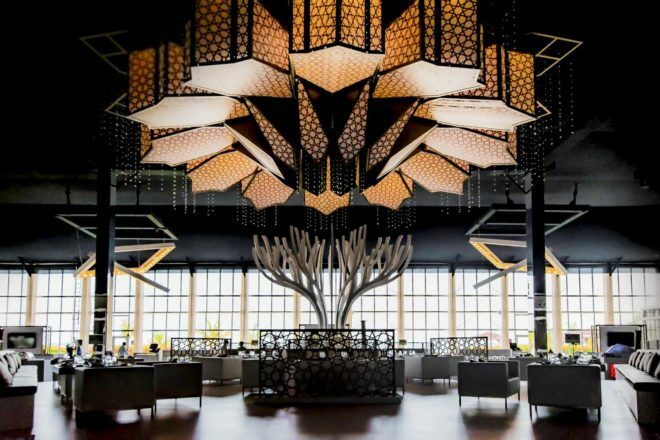 In 2018, the Dubai Opera auditorium was transformed into a magnificent banquet hall for Ramadan including four custom-built indoor majlis tents with tasselled arches and festoon lighting. 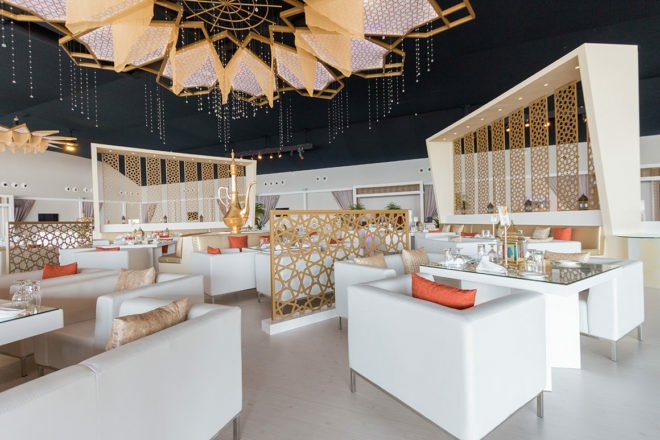 The Ramadan tents made for Emirates Palace in 2014 and 2017 exuded light and a contemporary design flavour with the careful use of updated traditional elements including mashrabiya pieces. In 2014, a tent was used to expand the available space and decorated throughout using specially customised pieces such as table tops. Click here to read what InTents Magazine has to say about our Mashrabiya-inspired Ramadan tents. The secret of creating a special Ramadan tent is to know how to update and upgrade traditional features using a modern design vernacular. UAE Ramadan tents can range in style from traditional to traditional with some contemporary touches to completely modern. It is vital to have a light hand when using Arabian motifs as design inspiration. Bespoke design pieces can add touches of enchantment and increase a venue’s charm, for example in 2017, a bespoke chandelier was suspended from the ceiling in Emirates Palace and in 2016 we created individual seating areas for JBH. Carved mashrabiya-like panels and table top treatments are one of our most popular decorative items because the careful artistry and smooth abstract design is both modern and timeless. The mashrabiya pattern is a central feature of Middle Eastern art and architecture. Our extensive in-house production facilities can produce many different stylish and simple mashrabiya designs to order as well as other bespoke items. A huge wooden tree was also created for an Emirates Palace Ramadan tent. 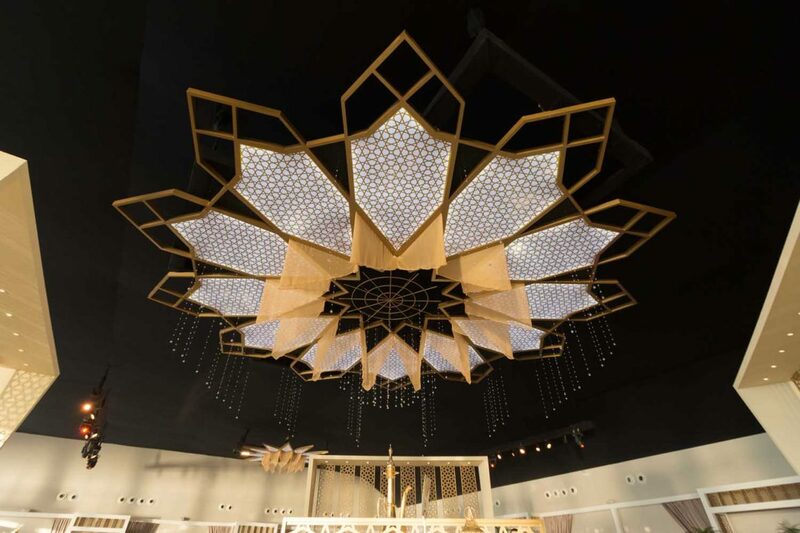 The Dubai Opera set up involved delicately combining traditional and contemporary motifs. 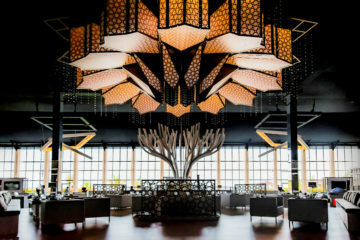 In tune with the prestigious surroundings, unique décor elements were integrated into the surroundings, including customised stunning illuminated table tops. The mood was enhanced by Mashrabiya-like patterns using luxurious cream shades, set off by understated blue toned lighting. The majlis seating areas blended the clean lines of contemporary and traditional design with richly textured cushions against brilliant white sofas and poufs, and brass work lanterns, inlaid with brightly coloured glass, framed by generously draped tassel arches. The real essence of Arabian hospitality focuses on making visitors and guests feel appreciated and comfortable. The secret to creating an immersive experience is to construct the sense of being in another world by focusing on the little details, such as scent, colours, lighting, furniture and other decorative accents. The subtle use of an Arabian colour palette based on white, cream and sandy shades, set off by deep rich shades of gold, copper, red and blue can build a rich and majestic environment. Combining modern and classic pieces can update and refresh a Ramadan atmosphere. Our furniture rental collection has been assembled to inspire creativity and innovation. 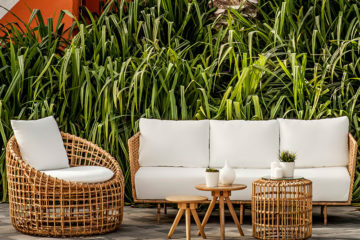 These Arabic-inspired furniture pieces have been carefully selected so that they can be combined with other styles to create exceptional contemporary set ups in tune with our modern sensibility. The use of opulent European fabrics for upholstery, curtains and tent draping all add to the mood. Lighting in the form of up lighting, spotlights, chandeliers, string lighting and illuminated furniture, creates areas of light and shadow that add delicate layers to the atmosphere, forming a distinctive aura that transports your guests to a new and more beautiful world. 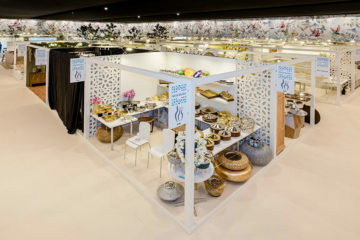 For example, in the Dubai Creek set up, the decorative theme was understated and contemporary. Customised furniture and decorative elements added an extra touch of class, including table tops, cushions and including a unique style feature, backlit Mashrabiya panels made in-house. 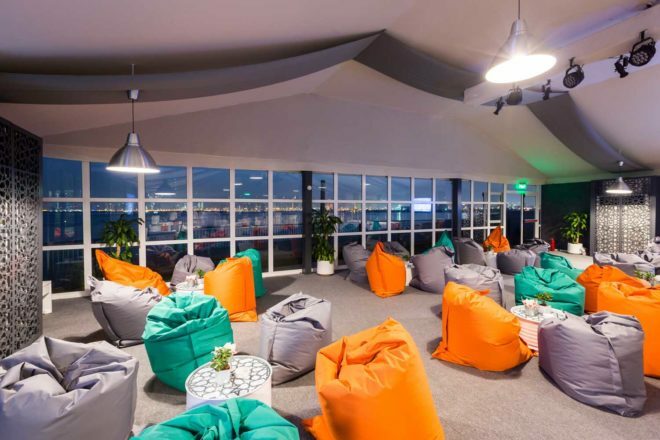 Brightly coloured beanbags were scattered throughout the seating areas to up the hip casual vibe. 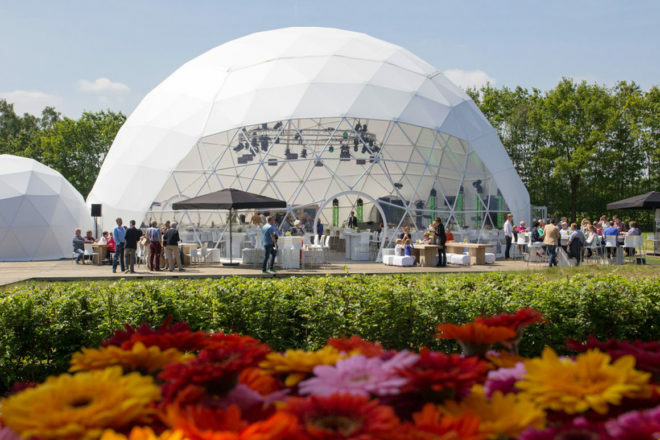 Temporary structures can expand your venue choices by creating a whole new site using one of our larger installations, like The Cube, or by expanding an existing space by covering a terrace or balcony area with a marquee. They can also be a vital building block for interior décor, creating entry ways, lounges and VIP areas. The care and attention you expend in preparing a unique and stylish tent to receive your guests not only reflects your brand image but conveys how much you value and respect your visitors or clients. 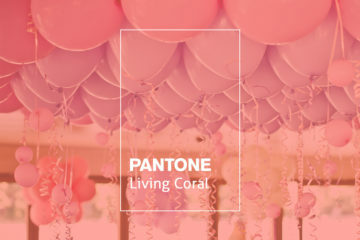 Creating a happy and memorable experience is about more than just setting up the tent, it’s about choosing the right lighting, colours and textures, as well as furniture and decorative accents to establish a mood. Different elements and motifs, minimalist and contemporary, traditional Emirati and Arabian, must be woven together into a harmonious atmosphere. 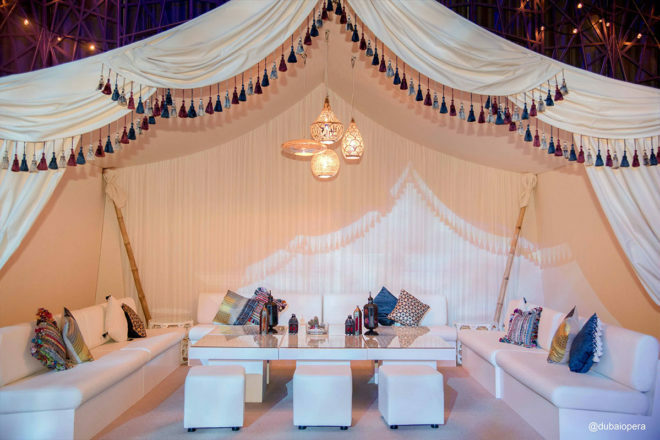 Check out our blog for more design inspirations for your Ramadan tents and don’t forget to explore your creative staging options using items from our unique Arabic style furniture rental collection.